Grab your BFF, jump on TriMet and head for some Big Fair Fun and maybe a little Brewers Festival Fun too! At the Washington County Fair, organizers say B.F.F. stands for Big Fair Fun! At Portland’s waterfront this weekend, it also stands for Brewers Festival fun. Whether you and your family are in the mood for carnival rides and entertainment at the fair, the high-flying action at the Oregon International Air Show or some craft beers at the Oregon Brewers Fest, let TriMet get you there! 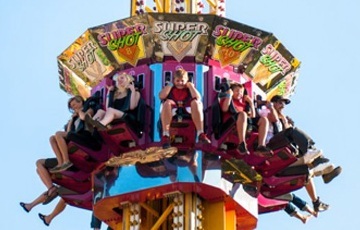 Take the MAX Blue Line to the Fair Complex/Hillsboro Airport Station and catch fair shuttle buses running regularly to the fair entrance, or walk about a third mile to the entrance. TriMet bus lines 46 and 48 run to the Fair Complex but have limited hours. Check before you go at trimet.org/schedules. Take the MAX Blue Line to the Fair Complex/Hillsboro Airport Station and walk about a fourth mile to the Hillsboro Airport. TriMet bus lines 46 and 48 run to the airport but have limited hours. Check before you go at trimet.org/schedules. Take MAX Blue and Red lines to the Oak/SW 1st Ave Stations and walk about a block to the festival entrance on Naito Parkway at Oak Street. Take MAX Green and Yellow lines to either the SW 5th & Oak St or SW 6th & Pine St Stations and walk the few blocks to the festival entrances on Naito Parkway at Oak Street or Pine Street. More than a dozen bus lines serve downtown Portland and would drop you a short walk from the waterfront. Check before you go at trimet.org/schedules. We have many useful tools to help you plan your outing. Use TriMet’s Trip Planner to help map out your route or m.trimet.org on your smartphone. Purchase tickets online at trimet.org or pick up tickets when you’re at the grocery store. More than 100 neighborhood retail outlets including most grocery stores and the TriMet Ticket Office at Pioneer Courthouse Square sell TriMet fares.